Interview with Ramón Labañino: "I did what’s right and have never endangered anyone." / Entrevista con Ramón Labañino: "Hice lo justo y jamás he dañado a nadie"
"I did what’s right and have never endangered anyone." That’s the assertion of Hero of the Cuban Republic Ramón Labañino Salazar who was unjustly sentenced to 30 years in prison that he is serving in a federal prison in Kentucky, in the United States. Now 51 years of age, he was 35 years old when they arrested them that early morning on September 12, 1998. Ramon with his wife Elizabeth and their daughters Laura and Lizbeth. Aili, another daughter from a previous marriage, is visiting him these days. That day in September, 2009 when they proceeded to resentence him in Miami, in the United States, Ramón Labañino Salazar, who was still carrying a life sentence plus 18 years in prison, entered the judicial chamber with his hands held high, as a victory symbol. Glancing around, he looked at all those present in the audience until he found his beloved Elizabeth. He smiled at her as if he were the happiest of mortals and with his look covered her with kisses. It was a fleeting moment but at the same time almost eternal. There were so many things being said at that moment! It was just like the one that happened later when he learned that his new sentence, no less unjust, would remove 30 years of physical liberty from his life. Then too his captors couldn’t lock up his soul and spirit. “I am by nature an optimistic man,” confessed Labañino, one of five Cuban anti-terrorists sentenced to long terms in U. S. prisons. The Five are brothers in the same struggle, although they are confined in prisons far apart from each other. They took to using “us” instead of “I” and what was important for one took on a collective nature. 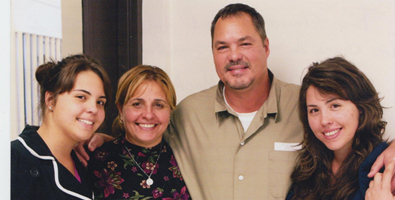 They did this from the beginning and every time a message arrives from them, the farewell invariably finishes with “five hugs.” That’s how Ramón ended these replies sent from the penitentiary in Ashland, Kentucky. The son of Nereyda Salazar Verduy (deceased) and Holmes Labañino Cantillo, Ramón was born June 9, 1963, in the Havana district of Marianao. He graduated with top academic recognition, qualifying in economics at the University of Havana. His greatest treasures are the daughters he adores, Aili (from his first marriage) Laura, and Lizbeth, as he tirelessly repeats. When he left home to work abroad, precisely in February, 1992, Elizabeth Palmeiro, his wife, was barely eight weeks pregnant with Laura. He could not enjoy that period or the arrival into the world of Lizbeth whom he only came to know in February, 1997, just after she was born. His comings and goings in and out of the country and then prison made it so that despite being married for 23 years, Ramón and Elizabeth have only lived together, without being apart, for barely two years. They’ve been separated the rest of the time. Nevertheless, they built a family together, and she, behind the lines, waits for him dealing with the family project that came about despite obstacles. There they are, “his beautiful women,” as he proudly says. How does a man succeed in overcoming great adversities? Where does one find such strength? Above all, when one is convinced that what he is doing is always correct, just, and legal, that one defends a humane cause, that one has never put anybody or any thing in danger, and that, on the contrary, he has sacrificed everything for the common good, for people’s lives – innocent people – then those ideas themselves lend enormous force of will and persistence against all adversities and “adversaries.” The fight is just. Victory will indeed have to be sweet. What do you recall about Ramón as a boy and young university student? I think I am an eternal child. That’s what my wife Elizabeth, my daughters, and whoever knows me say. I don’t know if that will always be true, or if they say it through the love they show me, but I do believe I’ve never lost (nor ever will) that youthful, smiling, cheerful, and optimistic spirit that helps one so much to live and struggle. I was that way as a child: smiley and very timid, very much so, I would say. And I always was enthralled by studying and doing sports. I remember from childhood that my little sister Laide began calling me “Papi.” I think that was because I took care of her a lot, and my mother instilled in us the idea that the family’s oldest brother is like a second father. And I think I accepted that role quite seriously, so much so that even today, many call me “Papi.” And that’s something my daughters resent, because they want to be the only ones saying that to me, but they know very well that I am the unique, the one and only “Papi,” from the soul to infinity, and that’s important. I really enjoyed my university years. As I said, studying and doing sports captivated me, and I could do both there fully. Also I was a student assistant in statistical mathematics beginning with the second year of the course. Sometimes I gave review courses and classes to comrades in the lower years or in our own year. It’s something I always liked a lot, teaching. I could practice judo and karate in the university, which was my dream in sports. It was a period of learning, but above all of growth. It helped me a lot in my formation and in my convictions in every sense, something for which I am infinitely grateful to Cuba, to our Revolution, to our socialist system. Do they see you as the big one of the group? That’s one point of view of those who see me. I don’t see myself as strong, rather I work to be “considered” thin. Of course, that continually costs me much effort to believe it myself. I do sports for pleasure, also because I need to get rid of so much stress, and because I feel much better and useful after each workout. I try to keep myself healthy in spite of the heartaches, since it’s our way of fighting and overcoming, of not letting ourselves fall apart or be destroyed. Now I myself am doing weights and long walks inside the prison, some handball, a lot of chess. That makes me feel healthy, vital, and ready for everyday struggles and ones in the future that surely will come. Who did you want to resemble? I myself sought guidance through example from the great ones, not to be them, since it’s impossible to attain icon status. But I have greatly admired and would try to be like Che, like our immortal Antonio Maceo, like José Martí, like Fidel, like Raúl, like Bolívar, like Sucre, and now a lot like our Hugo Chávez. They are in essence my everyday examples. I would be very pleased, simply, to be like every man who has decency and honor, but that would make this list too extensive. Could you let us know what you like by way of reading – historical personalities, fiction, [even television] series…? I am going to reduce the list to five for each category. I don’t want to bore you or be too exhaustive, but, look, among my favorite readings are: “One Hundred Years of Solitude” and “Love in the Time of Cholera,” by Gabriel García Márquez; “The Kingdom of this World,” by Alejo Carpentier: “Simple Verses,” by José Martí; and “The House of the Spirits, by Isabel Allende. From television series I can name “In Silence It Had to Be” and “Julito the Fisherman,” two excellent Cuban productions; and from another area – adventures – where I saw “The Commandos of Silence.” And I take the occasion to ask why they don’t make new versions of all these series on Cuban television. As to films, I point to “Strawberry and Chocolate” and ‘Undercover” (“Clandestinos”), where our much-admired Isabel Santos took the lead role. In regard to fictitious characters, there are these: Don Quijote and Sancho Panza, David in “In Silence It Had to Be,” interpreted by the late actor Sergio Corrieri; “Julito the Fisherman,” immortalized by René de la Cruz; and Bruce Lee in some of his films on martial arts, to mention a few. Historical figures that I feel are examples for imitation are: Simón Bolívar, Ernesto Che Guevara, Antonio Maceo, José Martí, and Fidel Castro. They arrested you when you were 35 years old. What is your concept of time? Time is a relative concept. If I think about myself, I think time does not pass. When I think of my daughters becoming women, when I look into the eyes of my beloved Eli, time becomes infinite for me, cruel, implacable. On that score, I go back to another time, one of laughter and joys, of return and happiness, to the precious time of our future, free in Cuba – and with that (my optimism), I stop. You already know I am a huge optimist, that I am going to remain that way, and so I am happy. One who is honored to die as I lived. If you close your eyes now, what do you see? I see Cuba, a beach blue, clean, and dazzling. I see Eli, my daughters, all my family, my people. I see laughter, joy, eternity. That way I make my freedom tangible and real. And I know it’s certain. (1) A “forced foot” (pie forzada) is a usually ten-line bit of improvised poetry that must end with a proposed verse, or as with Ramon, begin with it. "Hice lo justo y jamás he dañado a nadie"
Aquel día de diciembre del 2009, cuando fueron a resentenciarlo en la ciudad estadounidense de Miami, Ramón Labañino Sala­zar, quien aún cargaba con la sanción de una cadena perpetua más 18 años de cárcel, entró a la sala del tribunal con las manos en alto, en símbolo de victoria. Con su mirada lo escudriñó todo hasta encontrar entre los presentes en la audiencia a su querida Elizabeth. Le sonrió como el más feliz de los mortales y la cubrió de besos con la mirada. Fue un momento fugaz y a la vez casi eterno. Ramón junto a su esposa Elizabeth y sus hijas Laura y Lizbeth. Ailí, su otra hija de un matrimonio an­terior, se encuentra por estos dias visitándolo. Cuántas cosas se dijeron en aquel momento, similar al que vino después, cuando conoció que la nueva sentencia, igual de injusta, lo privaría 30 años de su vida de la libertad física, porque la del alma y el espíritu sus captores no han podido encerrarla. “Es que por naturaleza soy un hombre optimista”, confesó Labañino, uno de los cinco antiterroristas cubanos condenados a largas penas en cárceles de Estados Unidos. “Siempre he encontrado razones para ver el ángulo positivo en todo lo que me pasa, de todo lo que me rodea, de las peleas, incluso, de las injusticias, de las cosas duras que uno vive y ve en la prisión”, señaló en respuesta a un cuestionario el Héroe de la República de Cuba, título que comparte junto a sus compañeros Gerardo Hernández, Antonio Guerrero, Fernando González y René González (los dos úl­timos ya están en Cuba, pero purgaron antes la totalidad de sus sanciones). Así lo asumieron desde el inicio y cada vez que un mensaje de ellos llega la despe­dida termina, invariablemente, en “cinco abrazos” como escribió Ramón en estas repuestas en­viadas desde la penitenciaría de Ashland, en Kentucky. Hijo de Nereyda Salazar Verduy (falle­cida) y Holmes La­bañino Cantillo, nació el 9 de ju­nio de 1963 en el barrio habanero de Ma­rianao y se graduó con Diploma de Oro en la licenciatura de Economía, en la Uni­ver­sidad de La Ha­bana. Sus mayores tesoros son Ailí (de un primer matrimonio), Laura y Lizbeth, las hijas que no se cansa de repetir que adora. Justo en febrero de 1992, cuando se fue de casa para trabajar en el exterior, Elizabeth Palmeiro, su esposa, apenas tenía ocho se­manas de embarazo de Laura. Él no pudo dis­frutar esta etapa, ni tampoco la llegada al mundo de Lizbeth, a la que sí conoció recién nacida, en febrero de 1997. Sus entradas y salidas al país y luego la prisión provocaron que pese a llevar 23 años de casados, Ramón y Elizabeth solo han vivido juntos sin separarse, apenas dos, el resto ha sido a distancia. No obstante, ambos construyeron una fa­milia y ella, en la retaguardia, lo espera, al fren­te de un proyecto de familia que se logró por encima de los obstáculos y ahí es­tán “sus hermosas mujeres”, como él se enorgullece decir. —¿Cómo un hombre logra sobreponerse a las mayores adversidades? ¿De dónde es posible sacar tanta fortaleza? —Sobre todo cuando se tiene la convicción de que se está haciendo siempre lo co­rr­e­c­to, lo justo, lo legal, que uno defiende una causa humana, que jamás ha hecho daño a nadie ni a nada material, al contrario, se ha sacrificado todo por el bien común, por la vida de los pueblos, de personas inocentes, esa idea por sí sola da una fuerza enorme de voluntad y entereza en contra de todas las adversidades y “adversarios”. La pelea es jus­ta. La victoria de­berá ser mucho más dulce. —Del Ramón niño y del joven universitario. ¿Qué recuerdas? —Yo creo que soy un eterno niño, así me dicen mi esposa Elizabeth, mis hijas y quienes me conocen, no sé si será verdad o es por el amor que me devotan; pero sí creo que nunca he perdido (ni jamás lo haré) ese espíritu juvenil, risueño, alegre y optimista que tanto ayu­da a luchar a vivir y a luchar. “Así era de niño: risueño, muy tímido, mu­cho diría yo, y siempre me encantó estudiar y hacer deportes. “Recuerdo que desde pequeño mi hermanita Laide me empezó a llamar ‘papi’, creo que porque la cuidaba mucho y mi mamá nos educó con el concepto de que el hijo mayor de la familia es como el segundo padre. “Y pienso que ese papel me lo creí con mucha fe, tanto, que hoy día, muchos me dicen ‘papi’ y eso es algo que mis niñas re­sienten; porque quieren ser las únicas en decirme así, pero ellas saben muy bien que soy único e irrepetible Papi, desde el alma hasta el infinito, y eso es lo importante. “Disfruté mucho mis años de universidad, como dije me encanta estudiar y hacer deportes y allí pude desarrollar ampliamente ambas actividades. “También fui alumno ayudante de Esta­dística Matemática desde el segundo año de la carrera. “A veces daba repasos y clases a los compañeros de años inferiores o de nuestro propio año, es algo que también me gusta mu­cho: enseñar. “En la Universidad pude practicar judo y karate-do, que era mi sueño como depor­tis­ta. “Fue un periodo de aprendizaje, pero so­bre todo de crecimiento. Me ayudó mucho en mi formación y en mis convicciones en todos los sentidos, cosa que agradezco infinitamente a Cuba, a nuestra Revolución, a nuestro sistema socialista”. —Es un punto de vista de los que me ven. Yo no me veo fuerte, más bien trato de “considerarme” delgado. Claro, que eso me cuesta ca­da vez más trabajo creérmelo. “Hago deportes por placer, también por la necesidad de liberar tanto estrés, y porque me siento mucho mejor y útil después de cada jornada. “Trato de mantenerme saludable a pesar de los pesares, pues es nuestra manera de pelear y vencer, de no dejarnos derrumbar ni destruir. “Ahora mismo estoy haciendo pesas, caminatas dentro de la prisión, algo de handball, mucho ajedrez. Eso me hace sentir saludable, vital, listo para las contiendas de cada día y las que han de venir en el futuro”. —Trato de ser yo mismo guiado por el ejemplo de los grandes, pues es imposible alcanzar íconos; pero he admirado mucho y trataría de ser como el Che, como nuestro in­mortal Antonio Maceo, como José Martí, co­mo Fidel, como Raúl, como Bolívar, como Su­cre y ahora mucho como nuestro Hugo Chá­vez, ellos son en esencia mis ejemplos co­ti­dianos. “Me gustaría ser, simplemente, como ca­da hombre con decoro y honor que harían esta lista demasiado extensa”. —¿Déjanos saber qué te gusta en materia de lecturas, personajes históricos, de ficción, series…? —Voy a reducir la lista a cinco de cada uno, no quiero aburrirles ni ser tan exten­so, pero mira, entre mis lecturas favoritas están Cien años de soledad y El amor en los tiempos del cólera, de Gabriel García Már­quez; El reino de este mundo, de Alejo Carpen­tier; Los versos sencillos de José Martí y La Casa de los espíritus, de Isabel Allende. “De las series puedo nombrar En silencio ha tenido que ser y Julito el Pescador, dos excelentes producciones cubanas; también un espacio que existió: Aventuras, donde vi Los comandos del silencio. “Y aprovecho para preguntar ¿por qué no hacen en la televisión cubana una nueva versión de todos estos seriales? “En cuanto a las películas Fresa y Chocolate, y Clandestinos, protagonizada por nues­­tra admirable Isabel Santos. “Sobre los personajes de ficción, Don Quijote y Sancho Panza; el David de En si­lencio ha tenido que ser, interpretado por el des­parecido actor Sergio Corrieri, Julito el pescador inmortalizado por René de la Cruz y Bruce Lee, en alguna de sus películas por lo de las artes marciales, no por nada más. “Los personajes históricos coinciden con aquellos que siento como ejemplos a imitar: Simón Bolívar, Ernesto Che Guevara, An­to­nio Maceo, José Martí y Fidel Castro”. —Cuando te arrestaron tenías 35 años. ¿Cuál es tu concepto del tiempo? —El tiempo es un concepto relativo. Si pienso en mí, creo que el tiempo no ha pasado. Cuando veo a mis hijas hechas mujeres, cuando me miro en los ojos de mi Eli amada, el tiempo se me hace infinito, duro, impla­cable. “Por eso recurro al otro tiempo: al de las risas y las alegrías, al del retorno y la felicidad, al tiempo precioso de nuestro futuro libre en Cuba y con ese me quedo (mi optimismo)…Ya sabes soy un infinito optimista, qué le voy a hacer, y así soy feliz”. —Si cerraras ahora mismo los ojos, ¿qué ves? —Veo a Cuba, una playa azul limpia, deslumbrante. Veo a Eli, a mis hijas, a toda mi familia, a mi pueblo. Veo risas, alegría, eternidad. Así es como mi libertad se hace tangible y real. Y sé que es cierto.